One night in Amarillo, TX. We don’t like one night stays, especially when it’s an RV park we wish we could spend more time at but that’s what we have to do to make it across the country and not drive more than 7 hours at a time. We stayed at the Amarillo Ranch RV Park right off Interstate 40 about 10 minutes from the roadside attraction called Cadillac Ranch. After loading up on spray paint and leaving our mark on the famous art installation, we spent the evening playing Marco Polo at the indoor heated pool. 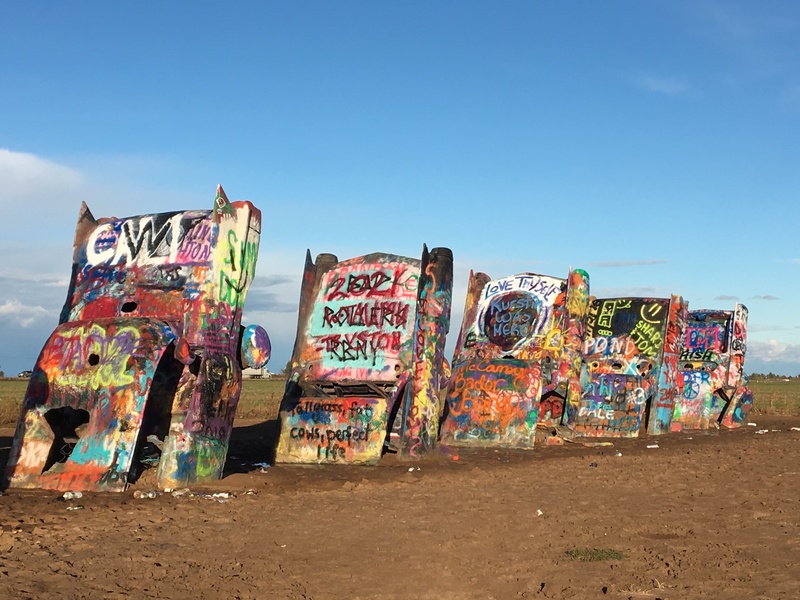 Right along Interstate 40 and Route 66 near Amarillo, TX is Cadillac Ranch. It was invented and built by a group artists hired by billionaire Stanley Marsh III. He wanted a piece of public art that would baffle the locals. In 1974, ten new Cadillac’s were driven into one of Mr. Marsh’s fields. They are lined up from the 1949 Club Sedan to the 1963 Sedan de Ville. The cars have been stripped of their insides and are layered with paint now. Spray painting the Cadillac’s at Cadillac Ranch was so much fun. It turns out the girls have always wanted to spray paint a public object. This may or may not be the first time I’ve defaced something in public with spray paint. The video is great- check it out!